The A4 Avant's safety features start with its Quattro system, a full-time all-wheel-drive system, with rear-torque bias. Under this system, power is supplied to all the wheels, but automatically directed to the ones with the most traction, which really helps in slippery conditions. Under normal circumstances, the rear-torque bias means the rear wheels get most of the power, creating a sportier driving experience. 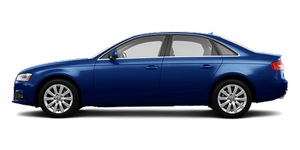 The A4 Avant also comes with four-wheel antilock brakes with brake assist, stability control and traction control. It has six airbags, including front- and side-impact airbags for the front row and side curtain airbags for both rows. Rear side-impact airbags for the backseat are available and cost $350. There's plenty of legroom in the back for adults or massive rear-facing infant-safety seats. Thankfully, the rear seats are mostly flat, so booster seats sit nicely without tilting or sliding over the seat belt receptors, which are also nice and firm. The two sets of Latch connectors should make Audi a favorite of parents everywhere. They're — wait for it — visible to the eye. They sit beneath a plastic cover that pops off easily, and the Latch connector is out there in plain view. Amazing, right? No hunting, digging, scraped knuckles or broken nails.